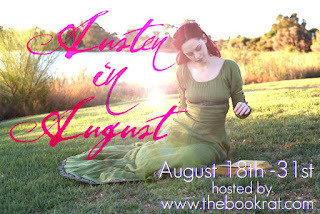 The Book Rat: Austen in August WINNERS!! Because many of you have the same or similar first names, I've tried to use initials for clarification - but even so, there are still lots of similarities in names, so just know all winners have been contacted - if you're not sure if you won, check your email! If you don't have an email from me, then sorry, someone has your name (that dirty sneak! ); if you're still unsure, and what to double check, feel free to email me for confirmation. Among the Janeites by Deborah Yaffe! $20 worth of prints from the Antique Fashionista! Handmade Amelia Webster folios from Alexa Adams! Sally Smith O'Rourke prize pack! Mr Darcy's Noble Connections by Abigail Reynolds! Kara Louise Book of Choice! Given Good Principles series by Maria Grace! Spies & Prejudice by Talia Vance! Mr Darcy Takes the Plunge by J. Marie Croft! My Own Mr Darcy by Karey White! Attempting Elizabeth audiobook from Jessica Grey! Mr Darcy's Undoing by Abigail Reynolds! The Love Affairs of Nathaniel P. by Adelle Waldman! 3 volume set of A Fair Prospect by Cassandra Grafton! First Impressions by Alexa Adams! Second Glances by Alexa Adams! Laurie Viera Rigler prize pack! Delilah Dirk & the Turkish Lieutenant by Tony Cliff! Please also note, this list is subject to change; in the event that someone turns down their prize or is later proven ineligible, a new winner will be chosen for that particular giveaway. Woohoo! I am so happy to have won a prize. This was a fabulous event and everyone was so generous with the giveaways. Thanks for putting it all together, Misty. Thanks for the giveaway! I'm so excited to have won! I had my fingers crossed all weekend hoping to win something....and I got exactly what I wanted. Thanks Misty and Cassandra!!!! I'm so excited. How cool is that?! I really wanted to win The Love Affairs of Nathaniel P. Thanks very much! I can't believe I won!!!! Thank you so much Misty!